Just wondered if there were any known solutions/causes of UI lag while using the editor. When I move my mouse around editor widgets there's a short delay between where the UI thinks my mouse is and where the cursor actually is. It appears to compound the more I interact with a widget/window, such as while browsing the right click menu in the content browser and various settings menus. It never gets unusably slow but it's tricky to follow where my cursor actually is. Here's a video of the issue in the UE 4.9 preview, though I have the same issue with 4.8. In the video the delay isn't so pronounced, but there are often times where the delay is significantly longer. When I searched answerhub I found somebody who had a similar issue and fixed it by disabling an on-screen display that came with their graphics card driver. Are there any other applications that may cause this issue? 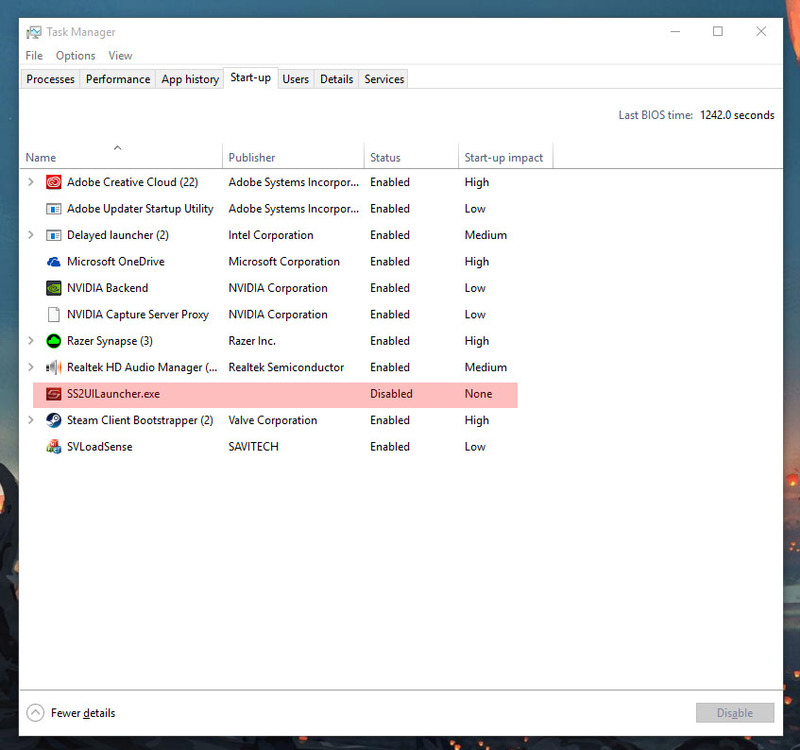 Taking a note from the post that was solved by disabling EVGA precision, went through all the applications and background services on my system to try and figure out the cause. In my case it appears that the "Sonic Studio 2" application that came with my motherboards onboard sound driver is the cause of this issue. Super Thanks! I was getting so annoyed for this issue. It was effecting other software like Unity 3d and 3D Max. Wow thanks for the help! This still breaks UE4 even months later. Probably something that Epic cannot fix. Tried contact ASUS about but SonarSuite but judging by the lack of updates we've been brushed off! Finally an answer to my problem... Thank you. UE 4.12.5 on pretty much the same hardware. Exactly the same issue. Additional info: Killing the SonarSuite processes alone does not help. You really have to disable autostart and reboot. Thank you for this! I've been searching frantically for a solution and this did it for me. Thanks, Nahimic was kinda slowing down everything, it also causes freezes when playing videos in navigators..
FYI, I got gtx 980 installed and recently the editor becomes very lagging. I just upgraded my nvidia driver to the most recent version, and the lagging issue is now solved. Just to add on to this.. I traditionally booted up the editor from Visual Studio using the local windows debugger option, which seems to have been the cause of some severe slowdown. After switching to just launching the editor via the Uproject / Epic Games Launcher things started running a lot smoother without anywhere near as much slowdown when interacting with the menus. Seems there's quite a performance hit when running with the debugger / VS attached. For those who could not solve the problem with the above solution. Disable ShadowPlay on GeForce Experience! Ever since 4.8, everything seems to slow down when playing. Are there any tutorials on performance optimization and resource management? Does it take less space to merge a lot of meshes into a big one?